This little temple will be the first you'll visit when you come to Hikone. Small in scale, Daishi-ji Temple is located just a five minute walk from Hikone Station, and is fondly referred to as "the Buddhist teacher in front of the station." 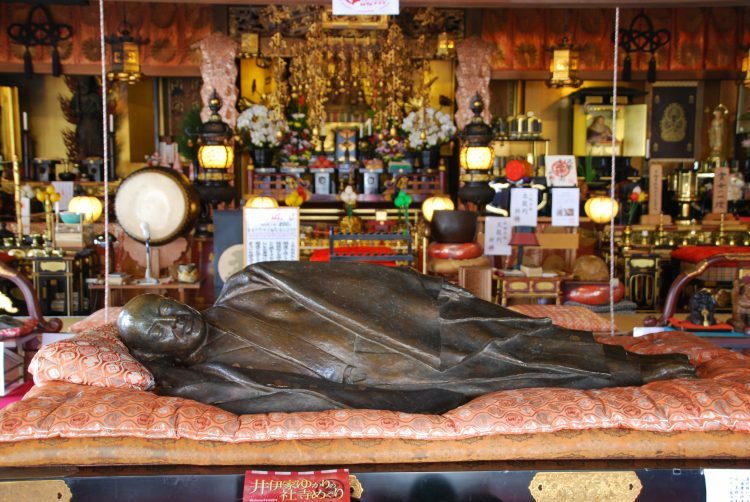 The temple is famous for its statue of a reclining Buddhist figure--the only such image in Japan. Preserved within the head of this reclining figure are a small piece of the ashes of the bones of the Buddha, shared with Daishi-ji Temple by Kyoto's Todai-ji Temple. It is said that the wishes of pilgrim's will be answered here with a touch of the head or the body of this reclining figure, and a prayer of praise to the Mahavairocana Buddha. 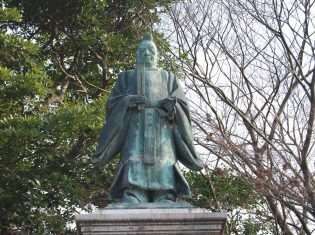 A series of paving stones are laid before these statues of the Seven Gods of Good Fortune, each treated with sand gathered from the route of Japan's famous Shikoku Pilgrimage. Visitors who walk across these paving stones will receive the same good fortune as if they had walked the length of the Shikoku Pilgrimage itself. Daishi-ji Temple offers blessings for those seeking prayers, including prayers for wisdom, and homa, the ritual burning of cedar sticks. Offering blessings to protection against misfortune, for safety and prosperity, traffic safety, health, success in school exams, etc.